Custom Logo Matte Textured Ribbon 1 1/2"
Custom Logo Matte Textured Ribbon 5/8"
Custom Logo Matte Textured Ribbon 7/8"
Custom Logo Satin Ribbon 1 1/2"
Custom Logo Satin Ribbon 5/8"
Custom Logo Satin Ribbon 7/8"
Custom Logo Ribbon - Need help in finding the right ribbon for your needs? Custom Logo Ribbon - Brand with it! Be a showstopper! Add that Aha touch! Great for your event, company party, favor or a giveaway at a trade show. 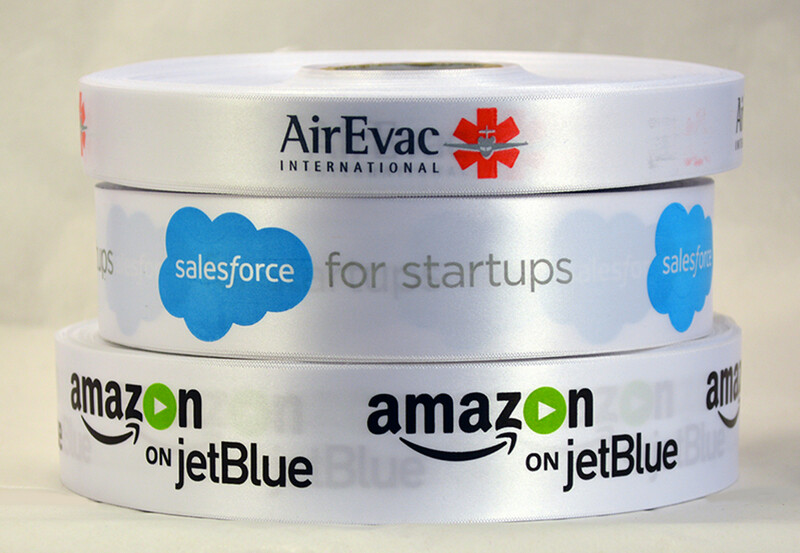 Promote and advertise your company with your very own custom ribbon with your logo. Simply send us your logo, select the ribbon size most suitable for your project, choose your ribbon color, quality and imprint color or colors. Select the spacing of your choice between imprints. Need a more durable or washable ink? Ask us! Double Faced Satin, Single Faced Satin, Matte Textured Ribbon, Grosgrain and special orders are all available. Highest quality luxurious logo ribbon comes on a continuous roll.Tell us what you want! We love to work on your "out of the box" ideas. We have an unusually large selection of hues and shades in stock. Many more are available by special order. Custom Pantone (PMS) Color Matching Service is available for your brand. CLICK HERE for Pantone matching. CLICK HERE for Two Color or Multi color Logo Ribbon. Need our crazy fast rush service? The typical delivery time is 3-5 weeks. Faster than this is a rush. Be sure to let us know when you need it so we can get it to you - on time! We know things get busy and we will work with you to make it happen! Rush charges will apply. Personalized printed ribbon was seen on Rachael Ray's Best Holiday Gift Ideas Show and was featured in Oprah's O Magazine in her Favorite Things List.